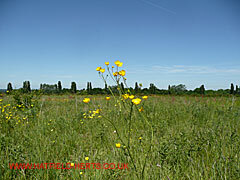 A site owned by Hertfordshire County Council (HCC). A former school it currently houses the Central Resources Library (the main Hertfordshire Library Service collection) and a last-chance school for troubled youngsters. 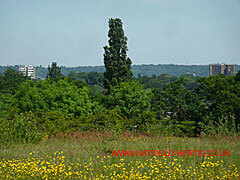 Built on a hill it occupies a vantage point in Hatfield which commands views of neighbouring St Albans and Welwyn Garden City. 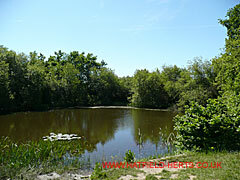 There are two ponds on the hill (the best known being Bunchleys) which are home to rare newts. 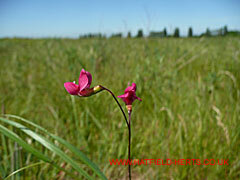 It is a beautiful site that if it had to be developed should be used for housing or as a recreational area. Looking across the summit of the hill at New Barnfield. The row of trees in the background mark the A1001 South Way. One of the ponds on the site. Home to rare newts. 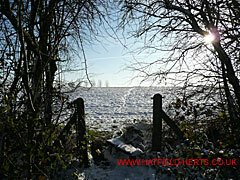 Wintery view across the field at the summit. 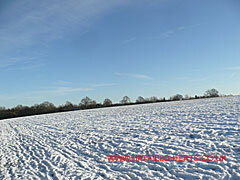 The treeline marks the back of Southfields special needs school and the Central Resources Library. As not many people want to live anywhere near an incinerator, the proposals are bad news for people who own property in or close to Hatfield. It will also have a significant negative impact on the value of business premises, particularly those close to or within sight of the site. The proposals are for a 270,000 tonne incinerator that will burn all of Hertfordshire's waste. However, there are suspicions that it was always intended to burn waste from London and surrounding counties. In any case, it is likely to involve a constant stream of trucks (the County waste strategy also involves transporting waste by rail but it is not yet clear where or how the waste will be transferred from road to rail – if that is the intention and not just a ploy to 'strengthen' the case for selecting New Barnfield). The access road is the southern end of Travellers Lane – a narrow, small section of road off a major roundabout, which already handles HGV traffic for Tesco's Welham Green depot. Apart from congestion and air pollution there is also likely to be disturbance to Southfield special needs school. Long promised and long awaited – the new town centre already faced an uphill battle to attract the sort of businesses, investments and people that will help restore Hatfield's standing and reputation. The chances of attracting the kinds of business and tenants that will revitalise the town are now even slimmer. Even if the economy recovers in the next few years – and that's a big 'if' – average UK household incomes are unlikely to return to pre-crash levels. 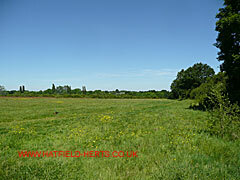 Having a population with a balanced range of incomes is important to Hatfield's economic future. Currently, with the large number of students and social needs cases being housed in the town it has proved difficult to attract inward investment (at least the sort the town can be proud of). The incinerator will make a bad situation worse – people with the means are likely to move out, and it will make it less attractive to potential employees (particularly skilled workers like University lecturers). Hatfield is ideally situated for London and Cambridge commuters but neither they nor students are likely to want to be anywhere near an incinerator – no matter how many safety assurances are given. A visit to the Edmonton incinerator (or the LondonWaste EcoPark to give it the name on the signs) revealed a vile stench noticeable a considerable distance downwind from the plant. While it should be noted that this site is larger than the one proposed at Hatfield and includes a composting facility, the visit took place on a cold day. This is significant as Enfield Council has previously served them with an enforcement order to remove 1,000 tons of smelly compost waste during hot weather. Hatfield House hosts several important outdoor events – none of which are likely to be enhanced by unpleasant odours. What appeared to be a holding yard not far from the plant also reeked of rotting organic matter and was surrounded by carrion birds. Logically, material will need to be stored on site to ensure the incinerator has a constant supply of fuel. This is likely to attract vermin and pose a health hazard. 1. Emissions to the atmosphere via chimneys or vents. 2. Solid ash residues – basically what is left after the waste has been burnt. These still have to be transported to a landfill site, which is likely to involve further carbon emissions. 3. Cooling water – used in the incineration process. There is an added risk of water pollution at New Barnfield as the hilltop has its own water sources (some suggest underground streams) and the risk of run off into streams at the base of the hill when it rains. As the financial implications affect all Hertfordshire taxpayers (which in an era of indirect / stealth taxes is anyone spending money) it is covered under the impact on Hertfordshire. What for many would be the key issue has been kept till last due to its complexity. Incineration can lead to the production of highly toxic chemical compounds like Dioxins and Furans, which have grave implications for human health if released into the atmosphere – IF an incinerator is properly designed and well-managed these SHOULD be removed by the purification system. In general, air pollution is a growing health concern and is caused by a number of things including incineration, coal fires and vehicle traffic. The body is unable to rid itself of very fine particles which get embedded in the lungs and with time prevent the body from getting the oxygen it needs. So anything that increases the amount of very fine particles (particularly toxic ones) in the atmosphere whether it be traffic or an incinerator is a bad thing. As with most risks to human health it is the very young, the very old and the infirm who are at the greatest risk.